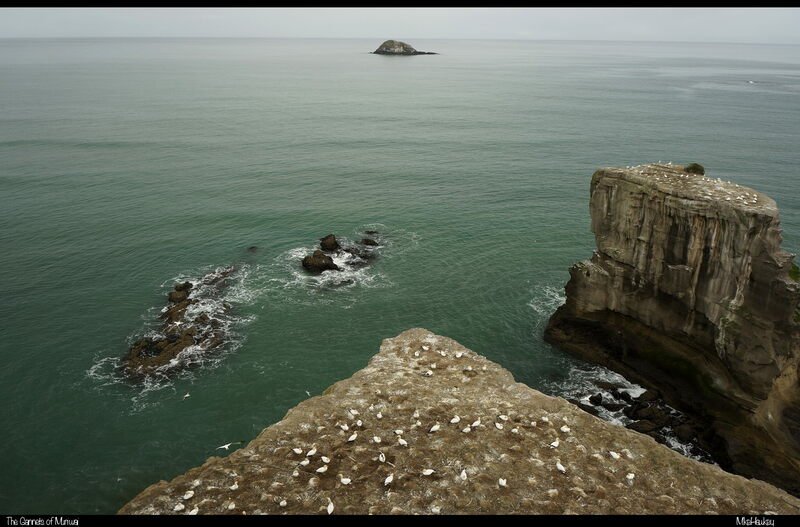 Todays shot, to some level or another, is likely mirrored in many peoples albums who have visited Muriwai. The gannets, when in full force, must be one of the major draw cards to this wild western beach. As mentioned yesterday, originally off the mainland (look to the horizon), once real-estate ran out, they began setting on the cliff top in the foreground of todays image. Centre right, half way down the rock wall, we can see the Terns lower populated spot that featured in yesterdays image. Out to the distance we can see Oaia Island, the Gannets motherland (for the area). Also home to fur seals, it paints an image of the sort of island a pirate may get marooned on when his crew shout a mutiny. Looking over the images form my visit, its amazing how calm the sea was last week!